Shun (Fukuda Saki), who has tattoos and piercings all over her body, is the third generation descendant of a Japanese orphan left behind in China during World War II. Takeru (Matsushita Yuya) is a lonely and reckless hooligan whose family was murdered when he was a child. 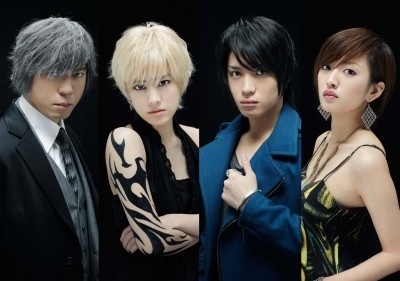 Shun, Takeru and Kasumi (Watanabe Natsuna) with an equally troubled past and background, become collaborators after being hired by Kuchinawa (Kamikawa Tamaya) in police undercover operations in the city of ‘Midori’, a neighbourhood for illegal residents. They infiltrate a criminal gang to investigate, and find illicit human drug experiments and slave treatment staring them in the face. They grow to trust one another and mature through this experience. Quartet is a very interesting show. I though about watching the show because of the main character (Fukuda Saki) I’m a fan of her work. The story was very dramatic, and I loved the action there. It’s like the characters are so real. I also liked the ending which adds extra points for the show. I liked the show very much and I totally recommend it.